Safwan Dahoul’s iconic portraitures of female protagonists covers the surface of a Dubai Metro carriage. As continuation of Dahoul’s monochromatic Dream series, the newly commissioned pieces see the addition of a crumpled effect that adds to an already heightening dramatic composition. 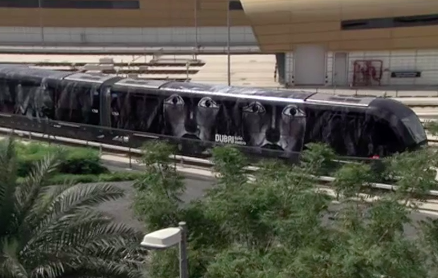 Part of an initiative launched by the Dubai Culture & Arts Authority and the Road & Transportation Authority, the project was inaugurated in simultaneity with Art Dubai, and showcased a photographic work by HH Sheikh Hamdan Bin Mohammed Bin Rashid Al Maktoum scaled up to one of the metro carriages. Pursuing celebrations of the Dubai Art Season, the carriage adorned by Dahoul’s Dreams is unveiled in conjunction with two more, presenting commissioned works by Emirati artist Abdul Qader Al Rais and Algerian Rachid Koraichi. Bringing art closer to local audiences, the project also aims at highlighting the multicultural circle of art practitioners living in Dubai.